KITTERY POINT, Maine — Construction work continues by the Pepperrell Cove Group on four new businesses in the buildings that housed Frisbee’s Market and Cap’n Simeon’s restaurant, with the convenience store, Provisions, eying an early March opening. Along with Provisions, the Pepperrell Cove Group will open two restaurants. Frisbee’s Wharf will open behind the Cap’n Simeon’s building on a crushed oyster shell patio, as a way of paying homage to the Frisbee family, whose local roots extend back to the 1700s. The other restaurant will be named Bistro 1828 in the Frisbee’s Market building. The View at Pepperrell Cove inside Cap’n Simeon’s building will be a two-floor function space for receptions and parties for approximately 140 guests. 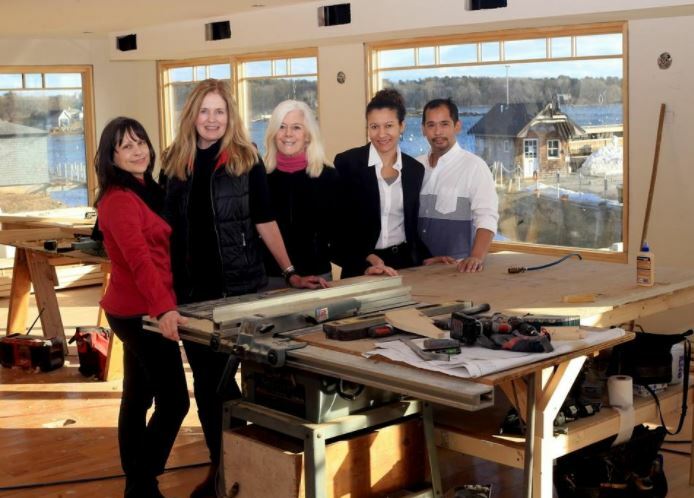 The Pepperrell Cove Group includes AJ’s Wood Grill Pizza co-owners Henry and Eides Ares, local developer and former AJ’s owner Donna Ryan, retired York school teacher Ann Kendall and architect Carla Goodknight, founder of CJ Architects in Portsmouth. Their vision is to rehabilitate the Pepperrell Cove site as a maritime destination for both locals and tourists, according to Goodknight. Each member of the group will be responsible for the operation of one of the businesses. Kendall will run Provisions inside the former yacht club headquarters. She said the store features the old shelves from Frisbee’s Market and will offer all the basic necessities like milk, eggs, coffee and baked goods in the mornings along with wine and beer. It will also feature an ice cream window in the summer time. Ryan will oversee Frisbee’s Wharf and said it will sell freshly caught seafood right off the on-site wharf in an outdoor restaurant that will be open May 15 through Oct. 15 each year. It will have two fire pits with lounge seating and have transient moorings for visitors who want to boat to the restaurant. Eides Ares is in charge of The View at Pepperrell Cove, and said with a full kitchen, she will offer both onsite and offsite catering. She said The View is expected to open in March and will be available for rent for parties, wedding receptions and other functions. “I’m very energetic and excited it’s finally happening,” said Eides Ares, whose restaurant experience includes being chef at the Wentworth by the Sea Country Club in Rye and The Victory Restaurant in Portsmouth. Henry Ares grew up in Kittery and got his start as a chef cooking in the kitchen of the old Cap’n Simeons, where he worked 18 years. He will be in charge of Bistro 1828 that will feature fine casual dining on the first floor with a third floor roof-deck bar that looks out over the cove. He said the bar will be called the Pepperrell Cove Ski Club in honor of Frank Frisbee’s water ski club in the 1950s and will showcase historical photos from the cove’s history. Follow the progress of construction at PepperrellCove.com or email info@PepperrellCove.com.